Skip’s Polaris Razr. Photo by Robert McClintock, Copyright (c) 2013. Click to view larger size. 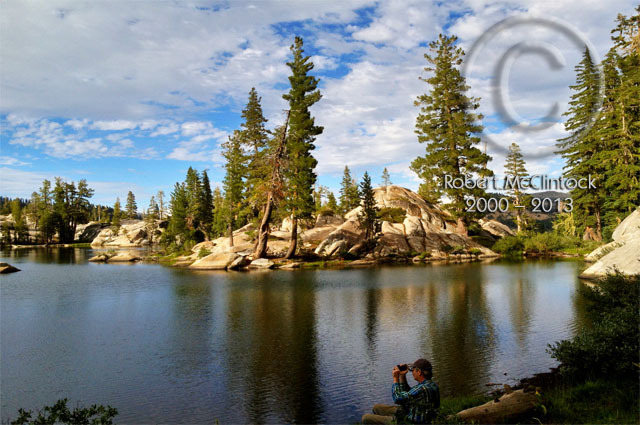 Last year, my friend Scott invited me to join him and his cousin in the High Sierras, about 65 miles northeast of Sacramento. He has a four-wheel Yamaha ATV and his cousin, Skip, has a four-wheel, four-wheel drive, four-seater Polaris Razr. Scott promised plenty of hair raising adventures and I had high hopes of enjoying some hair-restoration as a result. Scott had attempted to prepare me for the adventure, but it turned out to be another classic case where photographs, videos, and tall tales simply can’t describe the actual experience. Professional magazine ads, or even polished television video ads of four-wheel drive vehicles, such as Jeeps, are of a nature to make glamorous that which can be a very hazardous and dangerous pastime and yet, for all their well-intended promotion, fail to convey the heart thumping exhilarationthat “ya just gotta be there” feelingnecessary to fully comprehend and appreciate their messages. Again, the experience Scott promised was with ATVs. Contrary to the jacked-up pickup trucks or Jeeps with oversized wheels in those ads, these particular ATVs are small and low to the ground. The solo rides have larger wheels than the four-seaters and are like four wheeled motorcycles, but they are all diminutive in comparison to the more traditional vehicles. And, being low to the ground, one’s sense of speed is distorted: 20 mph feels and looks and rides like 60, while the mainstream vehicles separate the rider from direct contact with the environment. Some seat two and others fourthe latter are like a Volkswagen bug with the whole top peeled back like a banana. 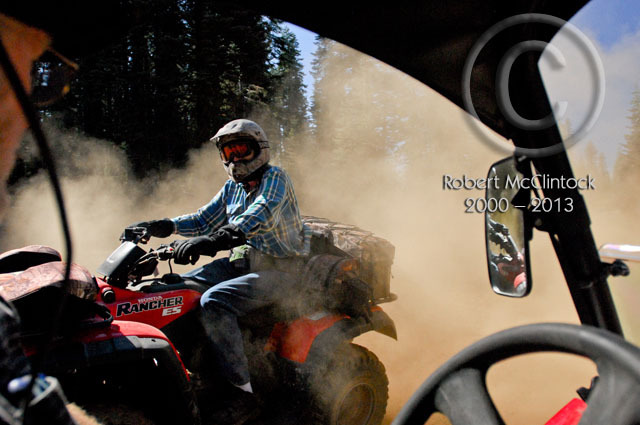 ATVs grant one a sense of freedom and adventure but have potential to be highly dangerous. One of its greatest threats is the perception of invulnerability, in the hands of an experienced and expert driver as Skip, however, the range of the vehicle and depth of exploration are almost without limit. Skip planning the next move. Photo by Robert McClintock, Copyright (c) 2013. Click to view larger size. Sitting next to Skip was one of the highlight continuums. He is an affable fellow, the kind that is comfortable with any kind of person, or any rank or social order, and can communicate at ease on his own level or theirs. It wasn’t until he muttered something in French that I kinda sorta thought he was a smart cookie; indeed, a man of incredible erudition, turned out he to be. 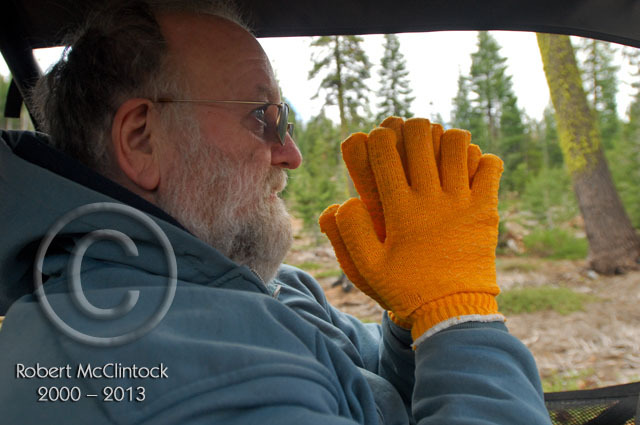 He seemed nonchalant when he drove, but closer examination revealed a steady set of eyes to match his hands. His driving skills might be compared to Caesar’s chariot driver on the treacherous mountain road, to whom the great Caesar asked how close to the steep precipice could he drive. After the first two drivers previously interviewed by for the job the Emperor bragged about how close to the edge they could maneuver his chariot, the final candidate answered, “I would never endanger the life of Caesar.” He got the job. The only difference was, when approaching the threshold of one of those petrifying yet alluring abysses, Skip would look at me with a twinkle in his eyes, probing for the go-ahead, to which I eagerly nodded a silent “YES; GO FOR IT,” after which he would (figuratively speaking) dangle one wheel off the edge of sheerness while yelling, “Hi ho, Silver, Away!” Well, maybe that is a bit of an exaggeration, but it’s close. The weather in the High Sierra, at any time of the year, is highly subject to rapid and precarious change. On my first trip, it had showered literally minutes before Scott and I arrived at Skip’s summer camp. The pavement in the entry way was still wet, and the pine trees still dripped fresh mountain rain. Yet, on each occasion, the weather cleared by mid-morning, ensuring spectacular views while leaving behind dampened roads and trails of mitigated dust. The general geographical area of our ATV adventures was Yuba Gap, and all points in circumference. Most of our travels took us into places I would have not imagined accessible for any but the most rugged of vehicles yet, in some of those areas we passed a couple of mini-vans, passenger cars, and even a few compacts. The single word “incomprehensible” applied to the “city” cars, but they did not venture into the truly challenging terrains. The directions we took were, quite literally, up, down, left, and right, and all manner of diagonals, where down often meant frighteningly steep and up signaled “Stop! Don’t even try this!” to anyone else in any other type of vehicle. Not only were these “roads” precipitous, they were often not much more than a rain gully for spring snow runoff, ladened with large rocks and interrupted by sudden dips that nearly swallowed the Razr. Some were fire breaks and fire trails and yet, surprisingly, once we chugged our way past these seemingly insurmountably obstacles, we often would find well-groomed and broad roadways that could accommodate any luxury automobile. 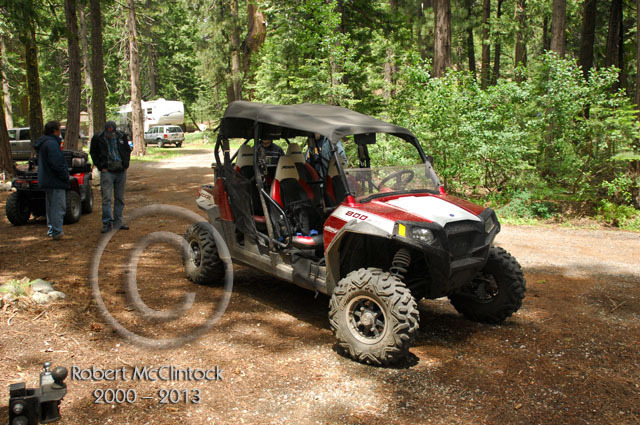 Skip’s rig, the Polaris Razr, was a beauty and unexpectedly comfortable. Then, again, it might not have been as I was so busy photographing the experience with both my Nikon and my iPhone (for movies) while trying to grasp the immensity of the area and the thrill of the ride itself. As I recall, though, I suffered no ill effects afterward, including lower back pains. As I had previously mentioned, the Razr accommodates three passengers and is remarkably stable. Under the command of an expert driver as Skip, I felt total confidence in riding across, over, under, and around nearly any given challenge nature had to offer. Over the course of my four visits, I met and the enjoyed many good people. Out in wildness, strangers tend to become instant (though respectably distant) friends. Riders passing riders know when to slow down to minimize their trailing dust wakes, which totally can block the view of the road for the oncoming driver, and inundate them with freshly churned dust. Often, people will simply stop to say hello and to ask where each has travelled or what might be ahead. Scott riding solo and kicking up a dust wake. 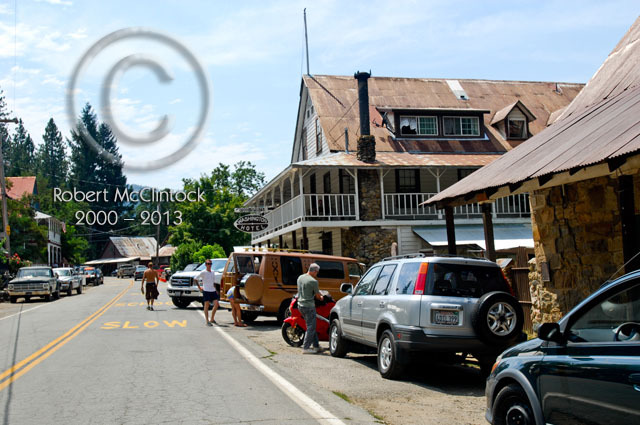 Photo by Robert McClintock, Copyright (c) 2013. The thrill of the ride would have been enough to feed me with lasting memories and impressions, but the ride was not the end, only the journeyas the saying goes. On each excursion, we had goals: destinations of pristine beauty, canyons of grandeur, and delicacies of nature of Lilliputian dimensions. These included magnanimous mountains, gorges with sheering cliffs, looming vistas, tiny rivulets, and many lakesboth man-made and natural. Washington’s main street. Photo by Robert McClintock, Copyright (c) 2013. Lake Lola Montez. Photo by Robert McClintock, Copyright (c) 2013. During my four excursions, we visited several of the beautiful lakes comfortably nestled in the protective mountainous terrain. Perhaps my favorite was and is Lake Lola Montez, named after the famous entertainer in the Gold Rush Days and who actually lived in nearby Grass Valley for a few years. It is petite, lovely, and simply perfect, and aptly named. Old CPRR Hut. Photo by Robert McClintock, Copyright (c) 2013. 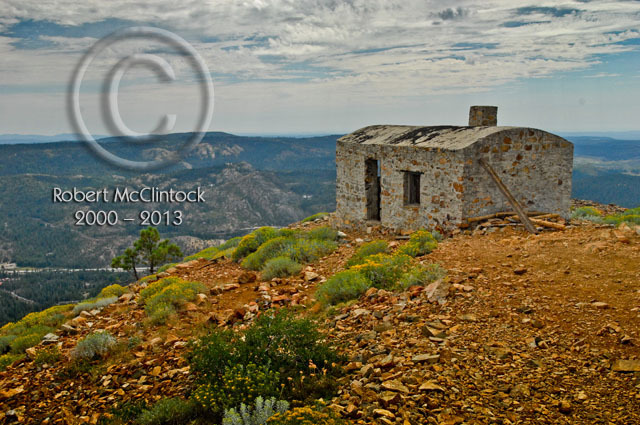 One of the more intriguing sites to which we trekked was an old Central Pacific Signal Hut and Fire Lookout Station atop Red Mountain, at Signal Peak. It is due west of Cisco Grove, off of and high above Interstate 80. The hut is a tiny rock building with a couple of iron doors, two small rooms, and a cupola window viewing area. As a lookout, it provides a vast view of I-80 and the canyon, but more importantly, its key location enabled the operators of the lookout a clear view of the railroad which, when it was built in the late 1800s (just a couple of decades after the transcontinental railroad was completed), was the Central Pacific, and which subsequently became the Southern Pacific RR. Apparently it served as both a fire lookout as well as a signal post, where the operator could signal the east and west bound trains. I’m not entirely sure on the latter. In any case, the view is stunning, and fills in another niche of our incredible history in California. Four treks created thousands of views and memories indelibly imprinted on my mind’s senses, as well as my camera’s “virtual” sensors. It is quite possible that one can never have redundant experiences in the High Sierras, no matter what the venue of choice might be. Every day and every trek presents a new quest promising new adventures and endless exploration. I’m looking forward to this coming summer’s promises, renewed camaraderie, and your comments. In the following slideshow, the photos rotate through at a rapid pace. You may pause the show at any time, should you wish to linger on any particular photo. I hope you enjoy my photography and my music! To run the slideshow click anywhere on it. You may view the slideshow on YouTube if you are viewing on a smart phone or small device and the slideshow is truncated. This entry was posted in Adventure, Commentary, Documentary, Exploration, People, Quest, Travel by Vanessa. Bookmark the permalink. Getting off the well beaten road is a true adventure. And standing on soil never before touched by human feet is an incredible experience. But rather than approaching such a site by four wheels does not compare to the adventure of arriving there by parachute. I speak with authority having done both. Well put, Don. And fewer have arrived by parachute only to fight their way out, as have you. I realize the pictures cannot convey the true beauty and thrill of travelling in these amazing areas on these fantastic vehicles, but for an old mailman in Idaho I was able to catch a glimpse. Sort of like walking past a really good restaurant and smelling the aroma coming from the kitchen, but not having the required funds to go in and enjoy the full menu. I have always wanted to ride in one of these ATVs, go the places that most can’t go, and see the things that most will never see (at least with their own eyes- Thanks, Bob). Keep exploring, wandering and wondering. That is what keeps you young. I like your analogy. It’s good to have good friends as yourself, and Scott and Skip who made the adventures possible. I found myself wishing ‘for the good old days’ when we used to get off the beaten path and explore. Thoroughly enjoyable vicarious trip Bob. Yes, I well remember stories from you and Don. You both have had many great adventures, from the one loose boulder that could fill a pickup bed crashing onto your back, to sailing across the Atlantic and trimming the sails on a three-masted ship only to enter New York harbour to see the smoldering remains of the Twin Towers one week after 9/11–what a homecoming. You two should be writing a book, but it would have to go into the fiction category because few would believe it. An amazing life you two have shared! Amazing pictures, seems like a fun trip! It was an amazing trip–actually, all four were. I hope the music infused the intensity of the live experience. Hi Bob, This is Cheryl Lambert who graduated with you in 1964 from Red Bluff Union High School. We just had our 50th class reunion Sept. 5 and 6th and missed seeing you there. The committee making up a book about the reunion just notified me asking if I knew where you are now. I wrote you a few years ago after seeing an older calendar by you, which my husband and I liked a lot. We never found any calendars by you after that. You wrote back to me but now I have no idea where you are. Whitepages.com showed you in Sacramento, Carmichael and Red Bluff, Calif. Please write back with your current address and information. You have accomplished a lot since you graduated. Congratulations! Cheryl Lambert Nolte, Bellingham, Wash.